Yesterday I pretty much bit off more than I could chew, working on a HUGE map. As is my way I just knuckled down and keep gnawing at this map until it was done. In the end is took me almost two hours just to upload everything to Patreon. 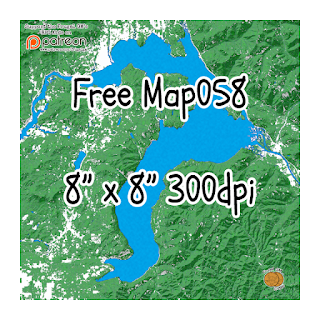 The "Finished" map was cropped to 75" x 80" and the resulting PNG file was 449 MB in size, way too big for most people to use. I ended up doing some more tweaking to come up with something better. First I cut off 2.5" from the top and bottom to square off the map and then I simply reduced the image size. My Patrons got the finished map in 3 working sizes: 24", 12", and 8". I also went ahead and sliced up the full-size beast of a map into 26" x 21" sections in case someone was brave enough to tray and assemble the entire map. Each section has 1" overlap with neighboring sections. 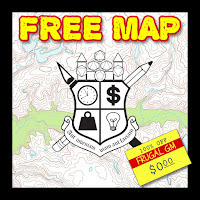 The free map today is just the 8" square version. Click on either graphic in this post to go to the Patreon download page, or use this link.